Until just a few years ago, when we thought of fashion it was always women’s fashion that sprang to mind: the press reporting on the new collections would invariably show glamorous women in fabulous dresses, top fashion labels advertising in glossy magazines would almost always display their women’s collections and so on. Now things have changed radically and men too are taking their rightful place in the fashion world, often even playing the starring role, and as such many men are starting to take a different approach to their physical appearance. The modern man pays much more attention to his body, going to the gym and eating healthily, and especially giving much more thought to his look and to matching his accessories for an impeccably groomed style. Within the scope of our tried and tested experience of the leather sector, we too have been aware of this change, as now a large section of our clientele is made up of men looking for top quality, stylish and prestigious accessories to give the finishing touch to their look. Many men have fallen in love with our python belts and e-mailed us asking whether we make men’s shoes in exotic leather, so that they can match their python belts or crocodile briefcases and document folders. Up till now we have had to respond in the negative, but from today, gentlemen, you will at last be able to order your own pair of python shoes to match your favourite python belt. We are also expanding our production and very soon our range of professional bags (which have only been available in natural leather so far) will be available to order in exotic leather too, so you will be able to look impeccably trendy and elegant at work too. But let’s get back to our shoe collection. 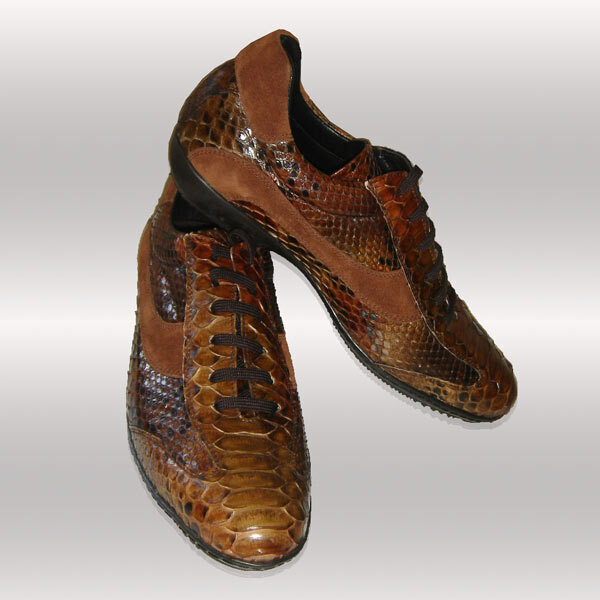 We have collaborated with some of our most skilled artisans, who have helped us create several shoe models, modern adaptations of classic designs, in genuine python leather with suede trims. Needless to say that these shoes, like the rest of our products, are 100% made in Italy by skilled Italian master leather workers, who know their profession inside out and whose families have been working leather with passion and pride for generations. Every detail is perfectly worked by hand and the leather we use, as for our handbags, comes from one of the best Italian tanneries. 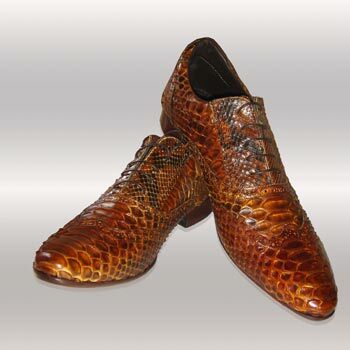 Our shoe collection isn’t intended to launch us in the fashion world as a new producer of men’s exotic leather shoes, but is rather designed as an extra service that we would like to offer to all our customers who have been looking for that perfect pair of python shoes to match their exotic leather belts and wallets. SF 11: this shoe incarnates the true elegance of the Made in Italy style. It is a classic, sleek shoe cut long and tapered and is entirely made of python leather. Unlike our other models this one has no suede trims. The whole upper is made from python leather, which gives this model indisputable prestige and value. The laces of this model, like SP12, are fine as befits a classic shoe, its inside is made from softest leather, and it is also leather-soled. SF 12: this is a smart shoe for dressy occasions, with its classic slightly tapered style, which makes it perfect for wearing with an elegant suit. The python leather, that the upper is almost entirely made from, gives the shoe elegance, prestige and gloss, while the suede trim softens the classic style and gives it an original twist. This model is also a lace-up, with finer laces than models SP13 and SP15, to reflect its more formal style. It is lined with soft leather, which makes this shoe not just good-looking and luxurious but also extremely comfortable. Its sole is also made of leather. SF 14: if you like a casual but refined look, this shoe is just right for you. The style is modern and fashionable, sporty but elegant too. 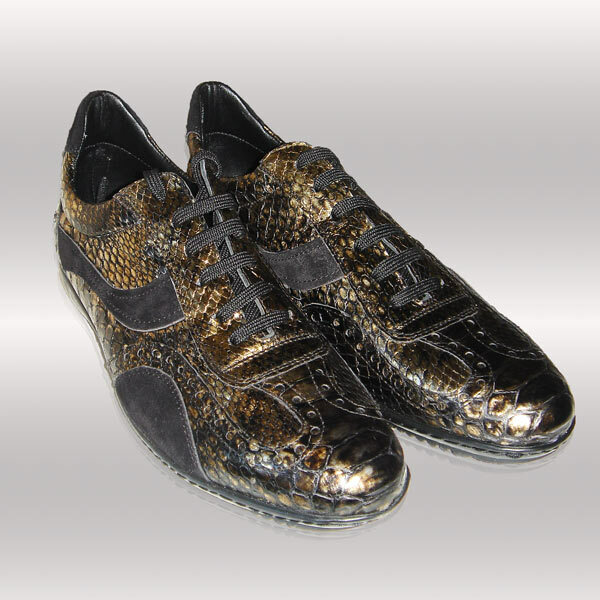 The soft python leather of the upper, gives it an element of prestige and shows that the person who wears it is perfectly groomed and takes care of every detail. The side strips and the back are made in quality suede, matched to the same color as the python leather. 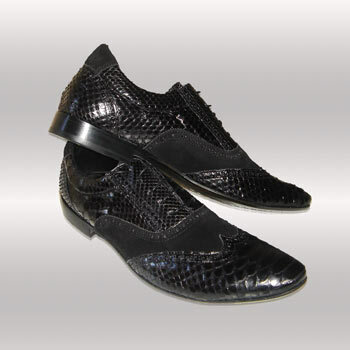 The laces are quite thick, as this model is aimed at young men who like to dress well but also want to feel comfortable. The lining is real leather and the sole is non-slip rubber. 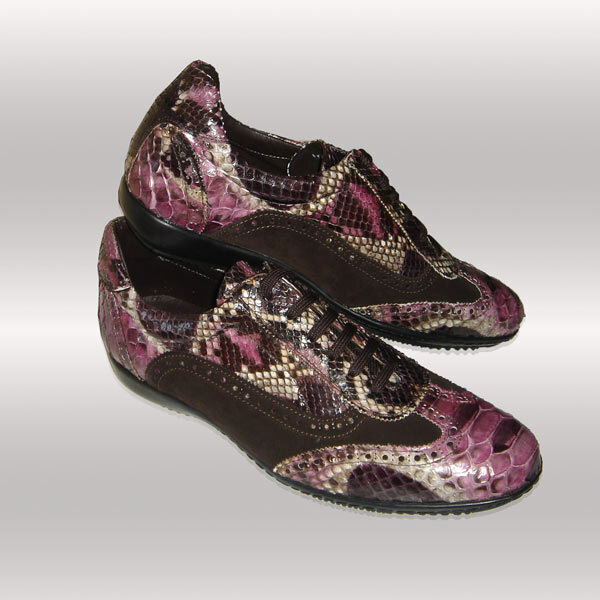 SF 15: as you can see from the photo, this shoe has slightly casual, sporty style, but the python skin adds enormous value to make it really chic and elegant. The side sections are made from suede and the sole is non-slip rubber. It is lined with real leather and the leather insole is very soft and comfortable. SF 13: this model too has its own attraction and elegance. The lace-up shoe is the perfect style to go with every type of clothing from casual to elegant, with its suede side trims (narrower than those of model SP15), which add a casual, trendy look to the shoe. The sole is non-slip rubber and the lining is natural leather, which is very important as it keeps your foot comfortable even after many hours of walking. With our mini-collection of men’s shoes, we want to give some time and thought to men’s fashion needs and wishes and to create a truly elegant article that will complement and enhance the style of an elegant man. What do you think? Let us know your thoughts and comments: we will be happy to hear from you and respond to all your comments! Pair of shoes 1 and 2 have great cut and I would be very interested in purchasing these styles to sell via our new e-commerce website when we launch within 2/3 weeks. Pair of shoes 3, 4, and 5 not so interesting. The overall style looks to suit the casual look or occasion, where as our customers would definatelt prefer the styles of shoes 1 and 2 (top to bottom position of shoes within your blog). Let’s also see more designs of men’s ankle boots and slip on shoes (non lace). Son realmente espectaculares, tanto que SF 11 es una obra de arte, como los siguientes modelos mas acordes a mi personalidad urbana, son espectaculares, realmente el primer modelo es digno de coleccion, y el resto de uso diario, en mi caso, me encantan…., los deportivos tambien valen para mujer? Yes I very much like styles one and two they look very nice and smart and would sell well to the Man who likes something different and classic. What way are you selling them in packs or what ? what will they cost also is important. i like SF15. i’m female. all i can say is WOW! good luck with launch of the shoe line. be a great author. I will be sure to bookmark your blog and will often come back sometime soon. We sometimes accept guest writers, just contact us on gleni@gleni.it telling us more about your ideas and we will get in touch with you!